"The experience I’m most looking forward to is the Indianapolis 500. I continue to hear what an unbelievable and life-changing type of an event it is. I think that it’s going to be even more exciting this year because we’ll have a minimum of 40 cars trying to qualify, which we haven’t seen in almost 15 years. It shows another wave in momentum as our sport continues to grow." - Indy Racing League CEO Randy Bernard, dropping a big "four-oh" on fans of The Greatest Spectacle In Racing. UPDATE: It's true: 40 entries, 73 cars total counting the "T"s. Bumpity bump! Ahhh, 40's. The savior of a poor college kid lookin to get his drunk on. 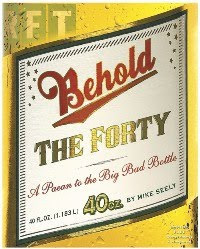 Still today 40's make an appearance at the 500 every year in the form Brass Monkey's!